SSALMON is an international scientific network, which was initiated on September 1st, 2014, in order to coordinate modeling efforts that will help to plan, optimize and analyze solar observations with the Atacama Large Millimeter/submillimeter Array (ALMA). This website is kindly hosted by the University of Oslo, Norway. See also the closely related, ERC-funded SolarALMA project. 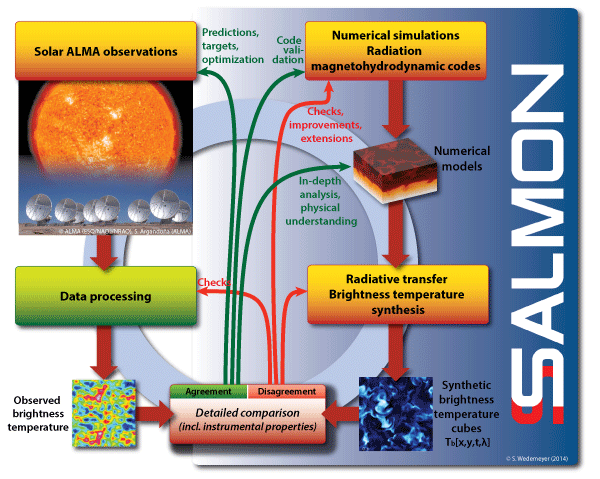 Numerical simulations of the solar chromosphere can play an important role for the planning, optimizing and interpretation of observations with ALMA. Synthetic brightness temperature maps, which are calculated from numerical models, can be used to simulate what ALMA would observe (see animation to the right). This way different instrumental set-ups can be tested and adjusted to the scientific requirements. The activities of our network will focus on all related simulation and modelling aspects from calculating models of the solar atmosphere, producing synthetic brightness temperature maps, applying instrumental effects to comparison with real ALMA observations of the Sun. The general procedure is outlined in the illustration below (click for large version). See our activity calendar for a full overview including previous activities. October 2018 Beginning of Cycle 6. Key goal 1 Raising awareness of science opportunities with ALMA. Key goal 2 Clear visibility of solar science within the ALMA community. Key goal 3 Constraining ALMA observing modes through modeling efforts that will help to plan, optimize and analyze solar observations. The network is open to everybody who has a professional interest in contributing to potential ALMA solar science, which include or require simulations. The SolarALMA project is funded with a Consolidator Grant by the European Research Council (ERC) and runs from September 2016 to August 2021. The team will consist of 4 (post-doctoral) researchers (incl. the PI) and 2 PhD students. The aim is to utilize the first observations of the Sun with the Atacama Large Millimeter/submillimeter Array (ALMA) to study the chromosphere of our Sun, which promises significant steps towards solving the solar coronal heating problem.